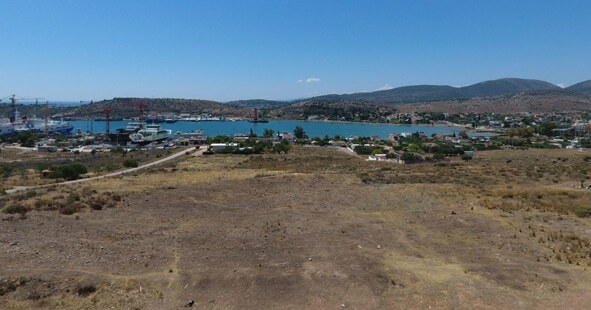 The collaboration between the Ephorate of Antiquities of West Attica, Piraeus and the Islands and the Finnish Institute at Athens will be carried out over five years (2016–2020) and it will concentrate on mapping the unbuilt part of the harbour town of ancient Salamis which is currently on dry land at Ambelakia Bay. The project directors are Dr Stella Chrisoulaki, the Ephor of West Attica, Piraeus and the islands, and Prof. Jari Pakkanen, Professor of Classical Archaeology at Royal Holloway, University of London and former director of the Finnish Institute. The project uses non-destructive methods: in the sub-soil reconnaissance three different geophysical means are employed, and full three-dimensional georeferenced recording of the visible archaeological remains is done with total stations, aerial drone photography and photogrammetry. Excavations are not part of the programme at this stage. In the research area cleaning of visible and previously excavated architectural remains and vegetation will be carried out. The geographical and archaeological data is integrated using GIS, CAD and photogrammetry software. The geophysical prospection is directed by Dr Apostolos Sarris of the GeoSat ReSeArch Lab of the Institute for Mediterranean Studies of the Foundation for Research and Technology, Hellas. The research and training collaborators include Dr Ann Brysbaert, University of Leiden, and Prof. Boris Rankov, Royal Holloway, University of London. The archaeologist responsible for the fieldwork on behalf of the Ephorate is Ms Ada Kattoula. As part of the Three-Dimensional Development Programme of the Institute, postgraduate and under­graduate students from the Finnish universities, the University of Leiden in the Netherlands and the University of Oxford were trained in 2016 and 2017 in three-dimensional archaeological documentation as part of the fieldwork. Ground penetrating radar (GPR), electrical resistivity and magnetic gradiometry techniques have been used in a complementary way for the geophysical prospection of the research area. Emphasis has been on detailed mapping of the sub-surface features of the investigated areas and layout of the geophysical grids has been georeferenced using total stations and differential GPS. The aerial survey of the research area was carried out in 2016 and 2017 using a radio-controlled drone. All architectural surveying and documentation is fully georeferenced and done with total stations and photogrammetry in three dimensions. These data are directly linked to GIS, CAD and photogrammetry software for further analysis already during the fieldwork season. 1) What is the spatial relationship between the archaeological remains which are currently visible on the surface? 2) Is it possible to find out the location of the civic centre of the town? Where is the agora? Were there monumental buildings? Especially, is it possible to detect the locations of the sanctuaries mentioned by Pausanias (1.35.3 and 1.36.1)? 3) Did the Classical town have a ‘Hippodamian’ grid design? If so, what were the dimensions of the city blocks? How large were the plots for the houses? What were the widths of streets? 4) Can the length of the possibly used grid module or foot-unit be detected on the basis of precise total station measurements and the only approximate geophysical data? Detailed recording and photogrammetry of the previously excavated areas will be completed 2018. These include the city walls and towers on the west and north-east sector of the town, two areas with ancient houses and the sanctuary of Bendis. The total coverage of the geophysical prospection with overlapping techniques has been 6.0 hectares in 2016 and 2017. GPR and magnetic gradiometry both suggest that ancient housing blocks and the road network covered most of the area inside the city walls. The architectural features have a fixed orientation and it is likely that further data analysis will make it possible to estimate some dimensions of the urban plots, blocks and street widths.